I am a Researcher at Microsoft Research. I got my Ph.D. from MIT in 2014 [old webpage]. I am passionate about building new developer tools and end-user applications. 2018 – HypeZone ships with Mixer, powered by Lookout. 2017 – Torch is shipping as part of CloudBuild. 2017 – Torch found several critical bugs in Azure, and is integrated into many services. 2017 – Embedded Social shipped with Windows Creators Update and Microsoft Academic Service. 2015 – Facebook’s mobile app monitoring was inspired by AppInsight deployed to all Android Facebook users. 2014 – VanarSena was briefly used by Windows Phone to find bugs in the OS. 2012 – Cambridge Mobile Telematics was founded on vTrack work. It is the fastest growing telematics service provider in the world deployed to millions of users. 2011 – TwitReviews had more than a million downloads. 2018 – Individual Performance Award, Microsoft. 2017 – Grand Prize Winner, Microsoft One Week Hackathon. 2017 – Rockstar Award, Microsoft Research Redmond Lab. 2017 – Exemplary Collaboration Award, Microsoft Research Redmond Lab. 2017 – Best Hack Project Award, Microsoft Redmond Science Fair. 2017 – Individual Performance Award, Microsoft. 2017 – Best Demo Award, ACM MobiSys. 2016 – Distinguished TPC member award, Infocom. 2015 – ACM SIGMOBILE Research Highlight (awarded to a small number of papers each year). 2015 – Microsoft LabOne (Bench/HiPo) Program (awarded to top 1% high performing employees across the entire company). 2011 – 2013 – Microsoft Research PhD Fellowship (given to 12 graduate students across several disciplines each year). 2011 – NSDI Best Paper Nominee. 2010 – Grand Prize Winner, Microsoft Windows 7 Gadget Competition. TwitReviews gadget was featured in the front page of Microsoft Gadgets website with over a million downloads. 2010 – Best Project Award, 6.864, MIT. 2009 – Best Paper Award, ACM SenSys. 2009 – Best Panelist Award, ACM S3. 2009 – Bank of America Award, BOA-MIT Mobile App Competition. 2008 – Cisco Graduate Fellowship. 2006 – Finalist, Code4Bill. Top 20 student technologists in India. 2006 – Gold Medal, Anna University (CEG) for top GPA across all disciplines. 2006 – Indian Prime Minister’s Guest of Honor at the Republic Day Parade. 2006 – TCS Best Student Award. 2005 – Annual day award for highest GPA. 2005 – 5th place, Asia Regional Finals, 30th ACM ICPC Programming Contest, India. 2004 – Alumni Association Award for highest GPA. 2004 – 2006 – Winner of several inter-college programming and project competitions. 2002 – Meritorious Student Award, Tamil Nadu Govt., for full score in Mathematics, Physics, and Chemistry in Higher Secondary Examination. 2017 – Organizer, 1st Microsoft Redmond Research Lab Puzzle Hunt. 2016 – Honorable Mention, Microsoft Research Halloween Decoration Contest. 2015 – Winner, Microsoft Research Halloween Decoration Contest. 2015 – 2017 – Volunteer, Computing for All. 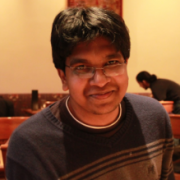 2008 – Organizer and Puzzle Master, 2nd Microsoft Research India Puzzle Hunt. 2007 – Organizer and Puzzle Master, 1st Microsoft Research India Puzzle Hunt. 2006 – President, Computer Society of Anna University. 2005 – Executive Member, ACM Chapter of Anna University. 2005 – Vice President, Computer Society of Anna University. 2002 – 2005 – Event organizer for several inter- and intra-college puzzle, project and programming events. 2018 – HypeZone for Fortnite, powered by Lookout, shipped with Mixer. 2018 – HypeZone for PUBG hits 1 million viewers. 2017 – HypeZone for PUBG, powered by Lookout, shipped with Mixer. 2017 – The Garage Favorite Award, Microsoft Redmond Science Fair.